My four kids have always been drawn to cameras. Our cell phones are loaded with the shots of their feet and the tops of their heads they’ve taken to amuse themselves on long car rides or while I’m working. Some of those shots aren’t even half-bad. So they were excited when shipments of cameras–real cameras, not phones with a camera feature–started arriving at the house especially for them to try out. And so was I. How great that the kids would have the opportunity to take real pictures, with a real camera they could use without fear of breaking? I think it’s likely, though, that all our expectations were a tad too high. My children were overall disappointed with the cameras, all except almost-three-year-old Owen, who a) tested the best camera of the lot and b) is young enough not to really care about quality. And while I wasn’t expecting them to start producing shots worthy of publication in National Geographic magazine, it would have been nice if they’d actually been able to get a couple of shots with recognizable lines and shadows between the lot of them. Here are the four cameras we tested and what we thought. You know that aisle at Target where all the toys are $5, $10, $15 or $20? The Pixie looks and feels like it came from that aisle. The plastic is thin, there’s no heft to it, and it has a chintzy feeling overall that would make it hard for me to trust it with a younger kid. Unfortunately, younger kids should really be the Pixie’s target market. Even my five-year-old was unimpressed. The Pixie is shaped exactly like a video game controller–even the buttons are in the same place–and actually doubles as a handheld game machine. This I found vaguely insulting…what, kids can’t muster up interest in something unless it reminds them of an X-Box controller? Also, the games were too hard for my 5-year-old to figure out–rendering them useless for that age group–and far too ‘lame’ for my nine-year-old to care about. All they seemed to really do was use up battery life and memory and complicate the camera’s use. The “on” button is a slider with three settings: on, camera, and games. It’s hard for little fingers to slide the button far enough over to get to the camera setting without sliding it too far over to the game setting. The theoretical good news about the Pixie is that it has 3 megapixel resolution, one of the best of the lot when it comes to kids’ cameras. There’s a digital zoom, and a 16 mb built-in storage card. And the LCD screen is brighter and bigger than most, so actually zeroing in on your subject was manageable for kids. I suppose those things would have been a boon had we ever been able to get the camera to work long enough to actually take a decent photo. Instead, we found that the camera was extremely buggy. Within a half-hour of receiving it and putting in the batteries (you have to screw a plate off the bottom to get the batteries in…does jumping through that particular hoop annoy any other parents as much as me?) the camera’s flash button stopped working. Just….stopped turning on. Then, the camera decided it was “full” with all of 12 pictures, but guess what? The delete button stopped working, too, so we couldn’t get rid of any of the test photos of the wall or somebody’s feet. Then the batteries died, no more than one hour after we had first turned it on. We replaced the batteries and tried again, and the camera started acting possessed. It was blinking, making a humming noise and seemed to be cycling back and forth between the camera and game mode. I checked Amazon to see if that particular problem was an anomaly, and found 22 mostly negative reviews, many of whom were also reporting buggy issues similar to ours. I also nearly choked on my tea when I saw that the Pixie retails for $129. Finally, late last night after yet another set of fresh batteries we were able to turn it on long enough to get the existing 12 pictures off of it. Unfortunately, all of my four kids have completely lost interest in it. Since this one is supposedly geared toward kids 8 and up, we let my 9- and 11-year-old sons test it out. The problem with this age group is that they are generally pretty savvy about what is good and bad technology. They were excited by the camera’s sleek look, but disappointed by its actual functionality and cheap feeling. One of my sons remarked that it looks and feels like a Happy Meal toy, and I had to agree. The LCD screen is unbelievably tiny and the quality is only 640 X 480, just about the minimum quality you’ll find in a digital camera. There’s no flash. Unless the lighting is absolutely perfect, it’s difficult to even see what you’re doing on the LCD screen, let alone take a halfway-decent shot. If this camera had been geared toward younger kids, I don’t think the low quality would have mattered so much. 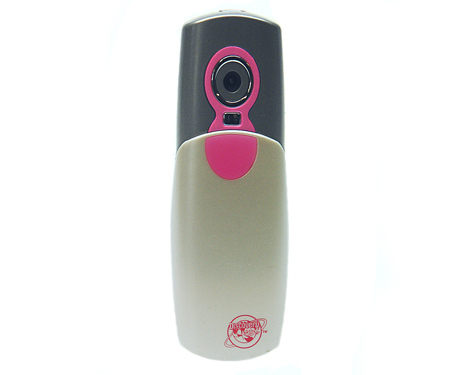 The Slide & Shoot Digital Camera is very easy to use, so a younger kid might have enjoyed just running around the house pointing and clicking. But it feels like the sort of thing a preschooler would break within a couple of days, and it’s small–really small–meaning easily lost. In the end, we had to settle for viewing the photos on the 1-inch camera screen. We couldn’t get the camera to work with either my husband’s computer (Mac) or mine (Dell running Vista). My computer kept trying to read the camera as a webcam, something it doubles as; but the drivers were on one of those mini-disks that you can’t use on a slot-loading CD-ROM. It wouldn’t work on my husband’s computer at all, despite a good half-hour of effort on his part. Since he makes his living as a computer tech and actually enjoys tinkering around with drivers that won’t cooperate, I would expect he gave it more effort than the average flustered parent would before giving up. In theory the Discovery Slide & Shoot Digital Camera isn’t a bad little device for the price ($39, on sale right now at the Discovery website for $32.99). I just think it’s geared toward the wrong age range of kids. Not too many in the eight-and-up set are likely to be impressed when they’ve taken better pictures on their parents’ (or their own) cell phone. The first thing I liked about this camera, the Little Tikes My Real Digital Camera, is that it’s obviously a TOY, geared toward small children. It feels durable and has a nice weight to it, the buttons are bright, well-placed for small hands, and easy to identify. It’s geared toward ages 3 and up, and both my younger kids (almost 3 and 5) enjoyed being able to walk around snapping lots of pictures without having to stop and delete all the time (with 64 MB of storage, the camera holds up to 93 photos). In addition to the tiny 1.3″ LCD screen, you can look through two holes like a Viewmaster. This didn’t bother my three-year-old at all, but my five-year-old, who has already had experience using grown-up cameras, was confused. He seemed to keep wanting to shut one eye and press the other against the hole instead. I tried the viewfinders and found it impossible to zero in on the photo subject. Also, it was hard even for me to hold the camera still enough to get a non-blurry shot, and when you used the flash, there’s a delay between hitting the button and the picture actually recording, so any pictures my two little ones tried to get of one another were not the shot they thought they were getting, but whatever that kid was doing two seconds later (usually, turning his head away). There was no noticeable delay when the flash was turned off, but the lighting had better be great or you won’t end up with much of a picture. The camera takes 4 AAA batteries, which are a total pain to put in (again with the screw-off panel!) but once in the battery life seemed decent. The camera hooked up easily to my computer with a USB cable and the pictures imported effortlessly, which is one less obstacle. Overall, my five-year-old thought it was an OK camera, but even he may be too spoiled by playing around with my camera phones to be really impressed. For a three-year-old, this camera would make a fun toy. At about $45 retail, the price is a bit high, but might be worth if it you find a good sale or have a young child who’s just dying to take pictures of his own. “Rugged” is an apt descriptor for this camera, Diego Npower Flash Jr. Rugged Digital Camera. It’s made of a non-slippery rubberized plastic and feels nice and heavy in the hands. I happen to know it made it through being dropped down our stairs several times without showing any signs of injury. When we got it, my three-year-old freaked out. A Diego camera? That looks just like something Diego Himself might use? Excelente! 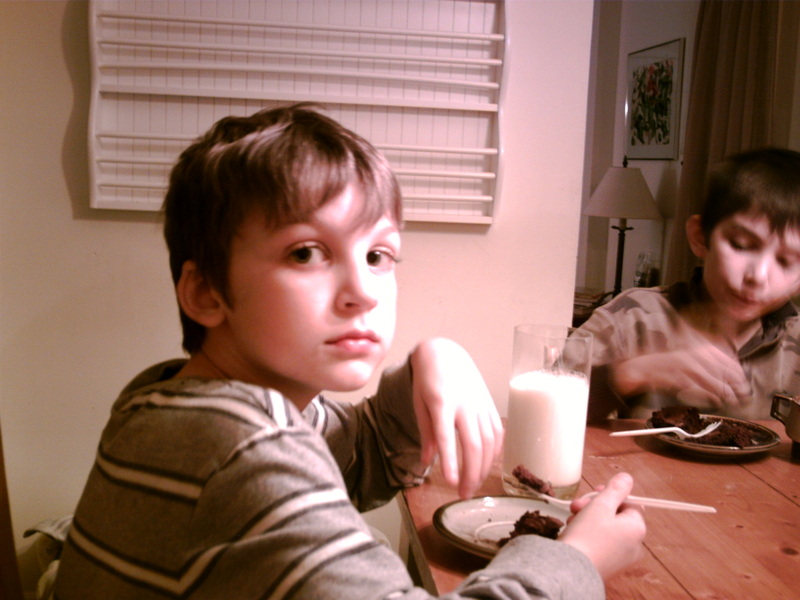 He couldn’t have cared less about actually getting any halfway decent pictures, but just ran around the house pointing the camera at anything in his path and hitting the buttons…before we’d even put in the batteries. As it turned out, setting the camera up was easy. Another screw plate for the batteries (#$*%!) but this one was big enough to be virtually un-loseable and the screws stayed lodged in the panel instead of coming out and getting lost on the floor. The camera takes 4 AA batteries and the battery life seems to be pretty good. The shutter button is very easy to use and in the perfect place for a small hand to curl around to. The flash is automatic and actually turns on when it needs to, and the delay isn’t too bad. The camera “talks” in Diego’s voice if you press either of two buttons on the front (Featuring The Map or Baby Jaguar) which could be annoying, but if you’ve got a Diego enthusiast in your house like I do, you’ve probably already figured out that pretty much every Diego toy out there likes to shout “A rescate, amigos!” every so often. The delete button and other features on the camera itself were a bit hard for my little ones–okay, and me, too–to figure out, but it was no big deal. It’s so easy to rig this camera up to your computer and import pictures that we just did the deleting then. Since the quality on the actual pictures is so low–0.3 resolution–and there’s 8 mb of storage (with the option of putting in a memory card to hold more pictures), the camera stores plenty of images before you need to worry about deleting any. There’s also a timer option in case a child wants to take a self-portrait, but this just confused my three-year-old. The pictures themselves? Eh. Again, lower-quality than what my kids have already been able to shoot using our cell phones, but we did get a shots that at least weren’t blurry, though they were still grainy. The camera comes with photo-editing software that didn’t interest either my three- or five-year-olds, who were much less worried about the end product than the joy of taking a picture. To us, the Diego Camera was a winner because it’s not trying to market itself as a real camera: it’s very clearly a toy, one that will last through lots of play, and most important, it’s aimed at the right age group. On the Nick Jr. website, the camera is priced at $59.99, but I’ve seen it around the internet for a little less. If I were shopping, $60 would be a bit hefty…$40 or so would be about right. If you’re looking for a digital camera for your child this holiday season, take your child’s age, tech-sophistication, and expectations into consideration first. If your child has already been tinkering around with your camera–even a cell-phone camera–he may be disappointed with the quality, functionality and kiddy look and feel of this crop of kids’ cameras. There are already enough inexpensive digital cameras out there that paying a lot for a kids’ version–especially for older children–just isn’t worth it in my book. 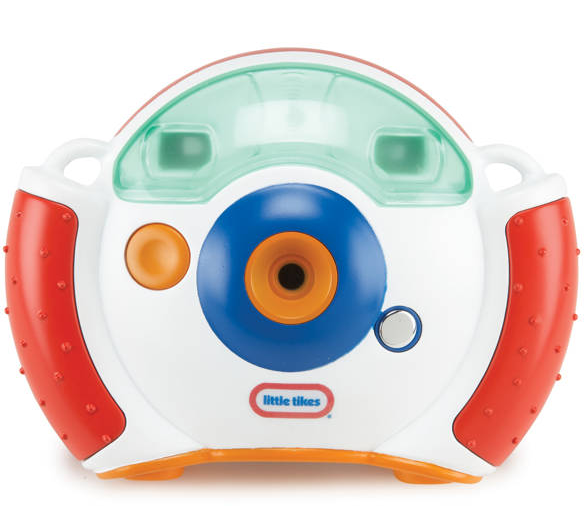 But for a preschooler who’s just starting to show interest in cameras, I’d say either the Diego or Little Tikes model could make a fun gift…especially if you can find them on sale. Please visit our first Kids’ Digital Camera Review where we review the Disney Pix Click Camera, the Nickelodeon Sponge Bob Square Pants Camera, the VTech Kidizoom Camera, and the Fisher Price Kid Tough Digital Camera. Thanks, this was enlightening, and not at all what I’d have expected. Wow, what a great and incredibly helpful review! Exactly the kind of info needed to make a good decision about which camera to buy. Thank you! Cute kids! 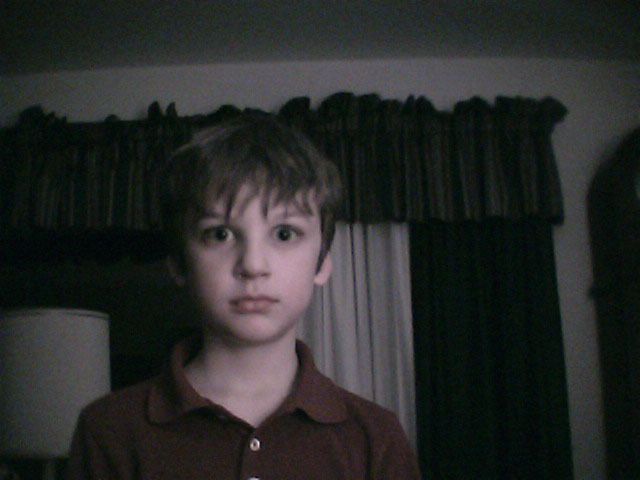 My 9yo has been on me for a camera for some time. I think an older point and shoot is probably the way to go after reading this! I’ve been thinking about getting one of these kiddie-cameras for my 4-year-old, and your review has been very helpful for me in rethinking that! We may just wait a bit until he can handle a “real” one ok and go with that. Kids do so love taking pictures! Thanks for letting me know what’s out there and giving me ideas for my nieces and nephews! I’ve had little hands grabbing for my camera ever since my son was two years old. Kids *love* taking pictures! Thanks for the review and for giving me ideas for my nieces and nephews! Thanks for this. I’m still not sure what to get for my 4-year old who is actually quite a good photographer. I heard the battery life on the Fischer Price camera is terrible. Did you find that to be true? Thank you so much! Amazon is great, but I like a point of view from someone who’s looked at/used more than one or two of the products they’re looking at buying. I was pretty much sold on one product after reading the reviews on Amazon, but after checking your site and seeing the test photos, I’ve decided to reconsider purchasing a real camera. My 4 year old loves taking pictures with my expensive camera, and I think not getting better results would really frustrate him. Thanks for your time! As a tech-head mom with a house full of geeky kids, I agree. 😀 Over a certain age, just get them a “real” digital camera. Thanks for the reviews. The past few days I’ve done nothing but look at these cameras. The Pixie Poloroid and the Kidz VTech. I like the Polaroid because of the bigger screen, but it’s getting bad reviews. I have a 33 yr. old mentally disabled daughter that loves digital cameras. She loves to review the pictures taken. Does this one have that feature to review? This is a great site! Thanks for the help! I was just on ebay again, looking for a good price. I could just see my daughters frustration when something doesn’t work. I should just look for a “real” digital camera with a big screen that’s simple to work. Maybe in a store that offers a service plan. I’d be open to suggestions. Very good review Meagan! My 5-year-old granddaughter has a Little Tikes camera. She likes it because she can take a picture all by herself. I just loaded 132 pictures from her camera to iPhoto on my Mac. The load process went smoothly. Out of 132 images, I kept 14. We bought the VTECH camera before reading the review and were rally disappointed with the low resolution (0.3MP). willing to pay more for a camera with similar features but better quality, but it seems like that doesn’t exist… shame. a 4 yr old and we can not seem to get the pictures deleted from the camera. Can anyone give me any directions on this. This was very helpful! I actually just purchased the Diego camera..I have not taken it out of the box since I wanted to make sure the camera was good for my soon to be 3 year old. The camera is available at target on clearance for $24.99!!! So I am going to keep it for sure! Thanks so much for such a detailed review!! Thanks so much for this! My 4 year old loves to run around taking pictures of everything with our camera but I’m tired of cleaning fingerprints off the lense everytime I want to use it (or forgetting to clean them of first!) Plus i’m always afraid he’s going to drop it. This review gave me a great start as far as what to avoid. Thanks for the great pros and cons, this is very helpful. I’m looking for a reasonably good kids’ camera for my 3 year old grandsons. 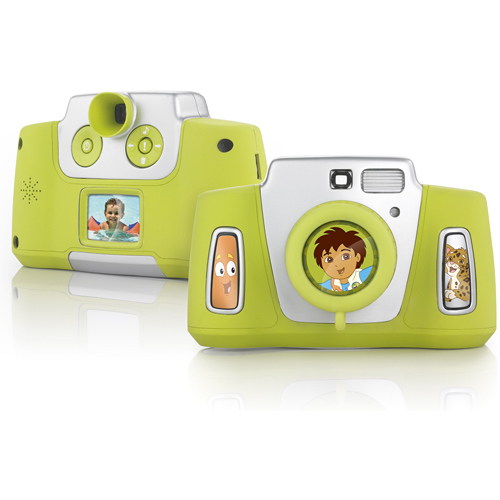 Can’t seem to find any reviews on the Discovery Kids camera–don’t know if it’s new on the market or what–anyone tried this one? I’m wondering the same thing as Mary. Anyone know about the Discovery Kids camera??? 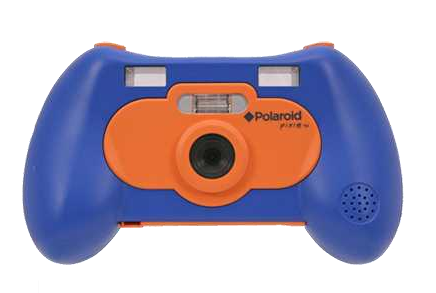 Just bought one for $24.99 at Kohl’s thinking of taking it out of the package and trying it out myself before giving to my 4 1/2 year old who just broke my camera…. I saw the Discovery Kids Camera suggested for Christmas gifts on the Early Show (12-1-09). Bought both Dora and Diego cameras 2 Christmases ago for my (then) 3.75 and 6 year olds. They’ve been great and still work, but the kids have grown out of them. True, the picture quality is bad, but in my case they were the only cameras in the house we used so no-one knew any better. Had a great time taking pix of kudzu “monsters” with my daughter one aft. Go for it. Thank you so much for taking the time to write this review. It is very helpful for me with almost 5 year old twins who always want to use MY digital camera to take pictures. Again, thank you for leading me in the right direction. Do you mind if I quote a couple of your posts as long as I provide credit and sources back to your website? My website is in the exact same niche as yours and my users would definitely benefit from a lot of the information you provide here. Please let me know if this alright with you. Regards! i tried to respond but your email bounced back. Spam? No you cannot quote our posts.